Ella discovered early chapter books this year (you know, the ones with four or five little chapters) and we have read dozens of them over the last many months. For some reason, she’s especially taken with the Berenstain Bear books, but I do try to encourage a little branching out (mainly because I can only read so many Berenstain Bear books before my brain starts to dribble out of my ears. I need to send my mom an apology letter for the many many Berenstain Bear books I made her read me when I was a kid. I swear, those books are laced with some addictive substance). Here are a few, both new and old, that we’ve both enjoyed. Tales of Amanda Pig by Jean Van Leeuwen and Ann Schweninger – I love the Oliver and Amanda Pig books so so much. Seriously, read them all. One of my favorite fictional families. A Bargain for Frances by Russell Hoban and Lillian Hoban – My mom loves the Frances books and they’ve been some of the books I was most excited to introduce Ella to. The charm hasn’t worn off! Penny and Her Marble by Kevin Henkes – All the Penny books are delightful, but this is the one Ella keeps going back to. Penny’s delighted to find a marble but then realizes she might have actually stolen it. Which means she now has to decide what to do with it. Urgency Emergency! Big Bad Wolf by Dosh Archer – After Halloween, it’s probably no surprise to you that Ella is a huge fan of the Little Red Riding Hood story. This spin on that story just about blew her mind. Frog and Toad are Friends by Arnold Lobel – I checked out a whole stack of Frog and Toad books for Ella and she hopped into bed with us a few days ago and asked Bart to read this to her. By the end of one story, Bart was laughing so hard he almost couldn’t speak. Not a bad way to start the morning. (I also love love love Owl at Home). George and Martha by James Marshall – These books get me every time; they are just so funny. I think James Marshall is one of the best writers out there. I need to request some of his Fox books, since I know Ella would get a kick out of them. Pinch and Dash and the Terrible Couch by Michael J. Daley – We got a copy of this when I was a Cybils judge in the fall and we have read it SO many times that Ella has nearly the entire thing memorized. When I was writing this post, I discovered that there is, in fact, another Pinch and Dash book, which I just reserved at the library and I’m kind of looking forward to the over-the-top reaction I’m sure it’ll get from her. (P.S. If you have favorites, I’d love any suggestions! Save me from the Berenstain Bears). I don't think they're chapter books, but we LOVED the Amelia Bedelia books when we were little! I loved the Henry and Mudge books when I was a kid. I thought I was so cool and grown up because I could read CHAPTER BOOKS. Anna (in kindergarten) has read and loved most of these books. She's also enjoyed the Bink and Gollie series and the Ling and Ting books. I can't wait to check out the ones we haven't read on your list because I feel like finding good books in this category is so hard! They're just the right length and difficulty for my daughter to read on her own, but so many we check out are just really boring. In the mean time we're making do with longer/harder picture books, and story collections with fewer pictures. Joe and Sparky by Jamie Michalak, Fox and Crow are NOT friends by Melissa Wiley, Monkey and Elephant by Carole Schaefer, Bramble and Maggie by Jessie Haas, and my childhood favorite republished – Meet Monster by Ellen Blance. You might also look at the National Geographic easy readers – gorgeous pictures and a great introduction to nonfiction. I feel like we're wearing out our welcome in this section of the library . . . it's difficult to keep my son supplied with enough books to read. We have not read Urgency Emergency though, so I'm excited to check out that one because it sounds like just the sort of book he will love. Besides the ones on your list, we also LOVE Mr. Putter & Tabby and Mercy Watson. We could read those books over and over again. I don't know if you'll ever be able to find them, but Lillian Hoban has a book called Mr. Pig and Sonny Too that we found at DI, and we love it. I also love her Arthur the monkey books, particularly Arthur and the Honey Bear. They might be a little too long for now, but my students really like Mr. Putter and Tabby, and Pinky and Rex books. 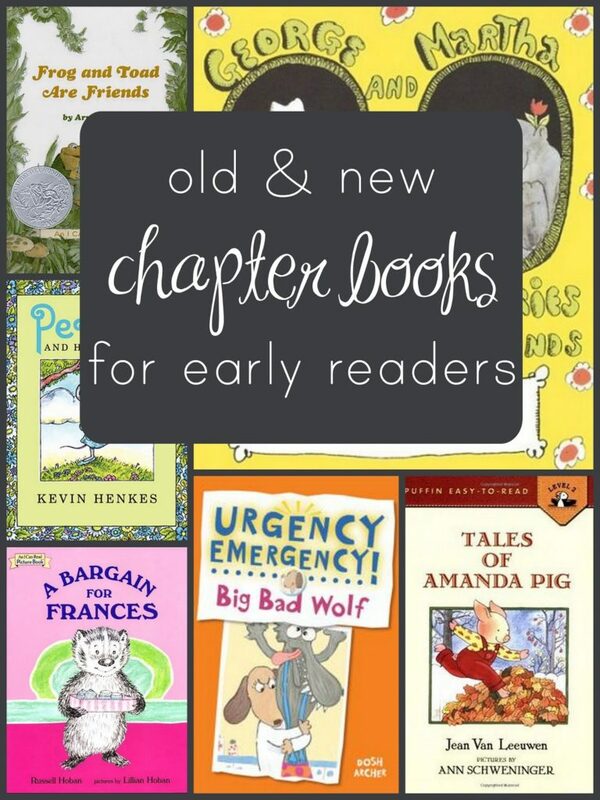 LOVED the Frances books as a kid :] and Frog and Toad is super popular in my class! I love, love, love the Francis books. LOVE. I love the Cowgirl Kate and Cocoa series by Erica Silverman but beware! Your little may be running around with a shoestring acting like it's a lasso and roping everything in sight! Have you read any of the Little Bear books to her? My four-year-old really loved the first one. oh I love the Frances books! Oh, why am I not posting?! Take two– The Frances books, Amelia Bedelia, and George and Martha were all big hits here too. We also enjoyed the Henry and Mudge books. A few other favorites were Babar, Harry the Dirty Dog, Lyle, Lyle, Crocodile, and my daughter's all-time favorite, Madeline, although not chapter books. Other recommendations of more complicated picture books would be the William Steig books (I still can't read Sylvester and the Magic Pebble without crying) and the Bill Peet books (How Droofus the Dragon Lost His Head was a favorite). We also enjoyed the Cam Jansen as well as the Danny Dunn mysteries, although I think she was a little older. So you probably already know that we LOVE this man — but BILL PEET. His books are the best thing ever. I'm not sure where to even tell you to start. Zella Zack and Zodiac is one of my favorites. Or Kermit the Hermit. Oh, I don't know how early this list is, but the Boxcar Children, Magic Treehouse and Junie B. Jones are all biiiiig hits at the library. (Oh, and anything Star Wars, but I am not the biggest fan of those.) Oh, and Captain Underpants. We just discovered Ling and Ting by Grace Lin….about Henry and Mudge length-wise, but about two identical twin girls. So cute. So far only 2 books out, but I absolutely love them- and so does my daughter! Great picks! I recently found some Winnie the pooh stories adapted into chapter books, and those are fun, too! Easier to read than the big, heavy version. My kids were big fans of Mercy Watson books by Kate DiCamillo. Oh! We just discovered Mercy Watson! So much fun. We also love henry and Mudge and the wayside school stories. We love Minnie and Moo books at our house. Very funny stories and my daughter giggles the whole way through.